Darwin International Airport is located 13 kilometres from the CBD (around a 15 minute drive). For satellite navigation devices, Darwin International Airport is located in Marrara, Northern Territory. The terminal at Darwin International Airport is open 24 hours a day, 7 days a week. Both domestic and international flights leave from the same building. ATMs are located throughout the terminal, including International Departures. Baby change rooms for parents are located on the ground floor near the car rental kiosks and first floor (opposite Gate 9 and near Green Bean café). There are also facilities in International Departures. Baggage trolleys are available free of charge for passengers. Trolley stands are located in the Baggage Collection area, in the car parks and throughout the Terminal. Darwin International Airport has three car parks that operate 24 hours a day, 7 days a week. The Short Stay car park is located directly in front of the Terminal building and is perfect for picking up or dropping off family and friends. The Long Stay Plus car park is located 200 metres from the Terminal and is suited for parking while on a short holiday. The Long Stay Saver car park is approximately 450 metres from the Terminal and offers reduced rate long term parking. Visit the Parking Options section for more information. All Terminal facilities are accessible for wheelchairs. Wheelchairs are available on request from airline staff if required. Download the Disability Access Facilitation Plan for more information. Dedicated disabled parking bays are conveniently located on either side of the pedestrian walkways that lead to the Terminal. These bays are clearly marked and are restricted to vehicles displaying a valid Disability Permit. Disabled parking is located within the Short Stay car park, closest to the terminal. Food and beverage outlets can be found in various locations throughout the Terminal. Please see the Food & Drink section for further information. Foreign currency exchange is available through the Travel Money Oz kiosk, located on the Ground Floor in the Arrivals Hall and on the First Floor in International Departures. Travel Money Oz also has several ATMs in the Terminal which dispense foreign currency. Baggage lockers are available for hire and are located within the walkway shelter in the Short Stay car park, adjacent to the Terminal Building. Allocation and payment is via a valid credit card only (VISA, MasterCard or American Express) at the self-payment console within the shelter. Once hired, customers can access the locker with a user-selected code (no physical key is required). For locker operations faults, please call 1300 369 008 or download the Locker Troubleshooting document. There is a lost property service at the Terminal Control Centre available from 8.00am - 2.00pm, located on the Ground Floor near Gate A or by telephoning +61 8 8920 1805. If you left an item on the aircraft you were travelling on, please contact the airline directly. Our retail stores have everything you’ll need for your flight and more. Please see the Shops section for further information. Shower facilities are available in the Domestic departures area on the first floor of the Terminal. The showers are available free of charge and cannot be booked in advance. Users must provide their own consumables i.e. towels, soap etc. Darwin International Airport Terminal is a smoke free zone. Toilets are located on both floors in the Terminal. The TRS office is operated by the Department of Immigration and Border Protection and is located near Gate 10 in the International Departures Lounge on the First Floor. have an original tax invoice for the goods. The Deptartment of Immigration and Border Protection mobile and web TRS applications (apps) allow you to enter the information required to lodge a TRS claim. Your information will be stored in a QR code and you must present this code, along with your purchased goods and original tax invoices, to the TRS facility at Darwin Airport on your departure from Australia. If you successfully enter your TRS Claim details using the apps, you will be able to use a dedicated queue at the TRS facility and processing your claim should be faster. Visit the Department of Immigration and Border Protection TRS apps page to access the applications. Taxis, Private Hire Cars and Shuttle Bus Services are readily available for hire by all travellers and are located just outside the Terminal. Drinking water is available from the water fountains located on the Ground Floor of the Terminal and in the upstairs domestic departures lounge. Free wireless internet is available throughout the Terminal building. Simply log-in to DarwinAirport on your device. Darwin International Airport aims to provide facilities and services that promote accessibility for all members of the community. View our Disability Access Facilitation Plan for further details or see the links below. If you require special assistance while travelling, please speak with your airline or travel agent when booking your flight. Any further questions may be answered on your airline's website; refer to their special assistance policies and procedures for more information. Disabled parking is located in the public car park and is clearly signposted. There are areas at both arrivals and departures ends of the public car park. The disabled parking is located at the closest point in the car park to the Terminal. An appropriate disabled permit sticker must be displayed to park in these spaces. A shuttle bus service can be arrange from the hotel to Darwin CBD or your hotel. Please contact the providers to make special arrangements for your travel. Security screening for disabled persons can require additional time, particularly during peak periods. All passengers must undergo the same level of security checks. The security screening point is located in the centre of the Terminal on the ground floor. Prior preparation by passengers is essential to ensure smooth security processing. Please liaise with the security staff on duty about any concerns you may have, including advising them if you have a medical condition that you are concerned may be affected by the screening process. (e.g. pacemakers and cochlear implants). The security screening staff undergo specific training in assisting passengers and visitors with disabilities using screening practice guidelines issued by the Office of Transport Security. Prams, strollers and wheelchairs are allowed entry to the 1st floor departure lounge (sterile area) however they must go through the security screening process. Staff are very familiar with the movement of passengers who are confined to a wheelchair. You should remove any loose items on your possession and place them on the conveyor belt to go though the x-ray machine. You will be required to undergo secondary screening by way of a frisk search. This screening can be done in a private area if requested. Prams and strollers are also required to be screened. You should liaise directly with the airline regarding the carriage of prams or strollers on board the aircraft. If you have artificial limbs/prostheses, and you are able to pass through the security metal detectors without activating it then no additional provisions are required. However if you are more comfortable with a private screening please advise the security staff of your condition and a separate screening will be arranged. Walking aids must be screened and as such may require X-Ray or Explosive Trace Detection. Screening points have chairs available for you during this process. Darwin International Airport also has private screening facilities in place for visitors with special needs, should they request this service or if security staff are required to complete additional screening as the visitor travels through the screening point. Please speak to security staff if you require this service. Like many aspects of flying with a disability, simply allow a little more time to pass through security. Dedicated disabled toilet facilities are located on the ground floor, in the domestic departure lounge on the first floor and also in the International arrivals and departures areas. Certified guide dogs, hearing dogs or other assistance dogs that assist a person with a disability are welcome inside the Terminal, under the Guide, Hearing and Assistance Dog Act 2009. Certified assistant dogs should be wearing the appropriate badge on their coat or harness and people accompanied by a dog, including trainers, must also carry an identity card. Physical assistance dogs will need to pass through the security screening point if they are going to the sterile departure and arrival area on the first floor. Physical assistance dogs are visually inspected by screening point staff, there is no requirement to remove the dog’s harnesses. Gardens outside the Terminal provide comfort areas for animals. 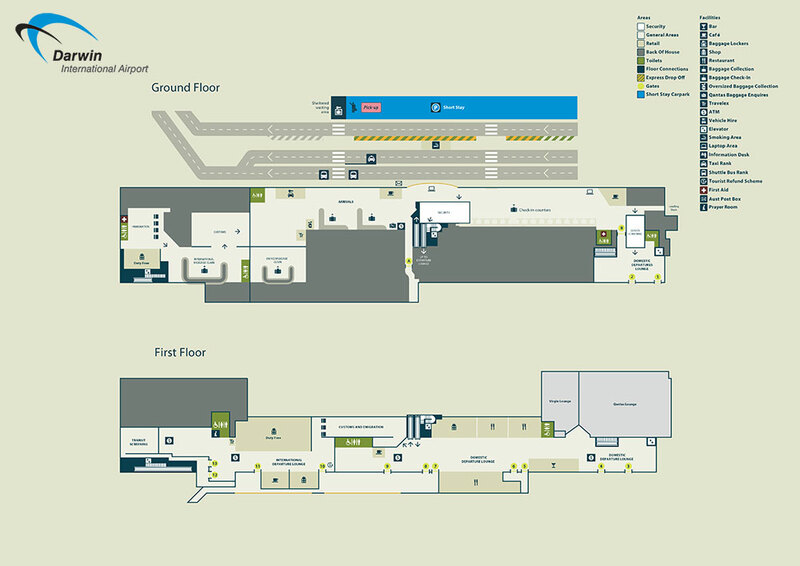 There is a First Aid Room available at Darwin International Airport - view location on terminal map. These rooms are primarily for use during an emergency or first aid incident, however, should a traveller or carer require a private room to administer medication for example, we can provide access. To arrange access to the First Aid Room, travellers first need to contact the Airport Duty Manager. Please proceed to the phone nearby the Terminal Control Centre (down the corridor opposite Giancarlo, ground level), and follow the prompts to contact the Darwin Airport staff member. Closed captions have been activated on Darwin International Airport televisions where possible. Darwin International Airport is committed to providing a safe and secure environment for all persons. We want your business trip or family holiday to be a hassle-free and an enjoyable experience. Security policies and procedures are updated frequently, so please take some time to view the links provided. Closed Circuit Television (CCTV) operates at Darwin International Airport as part of an ongoing Aviation Security initiative, targeting crime and aviation security related issues. CCTV significantly increases the ability to monitor areas of the airport and act on any unlawful activity immediately, increasing the safety of passengers, visitors to the airport and employees. These items are not allowed on aircraft as they are capable of posing a significant risk to health and safety when transported by air. Such items will be removed by security staff when detected. Further information on dangerous goods can be found using the CASA Dangerous Goods App. Video recorders and cameras may be carried within the terminal by travellers, however photos or footage of security screening equipment, security staff, Australian Customs processing staff or processes must not be taken at any time. Body scanning equipment has operated in all major Australian airports from December 2012. International and transit passengers at Darwin International Airport will be subject to body scanner screening, which will be conducted on a random and continuous basis. The body scanners are part of an Australian Federal Government initiative to further strengthen aviation security in Australia. Passengers who are selected to be screened by a body scanner and refuse will not be able to proceed into the departures lounge and will be unable to board their flight. Passengers will not be permitted to pass through the screening point for a 24 hour period following refusal. Exemptions will be made for passengers with serious medical conditions. Further information, including health and privacy FAQs, can be found on the TravelSECURE website. All enquiries should be directed to the Department of Infrastructure and Regional Development. To protect you from the threat of liquid explosives, there are rules for taking liquids, aerosols and gels on flights in and out of Australia. These rules also apply to passengers arriving on international flights who are transiting in Australia, and passengers travelling on the domestic leg of an international flight within Australia. The restrictions on the carriage of liquids, aerosols and gels apply to international flights to and from Australia, and to passengers on the domestic leg of an international flight within Australia. The restrictions limit the quantity of liquids, aerosols and gels passengers may take onboard the aircraft with them, including duty free liquids, aerosols and gels. The restrictions apply to products carried in the cabin of the aircraft by passengers. They do not apply to checked baggage carried in the hold of the aircraft. However, restrictions on dangerous goods still apply. If travelling on an international flight and you have duty free liquid, aerosol or gel items purchased from an off-airport duty free shop in a sealed bag and accompanied by a receipt provided at time of purchase, it is recommended that you place the items in the baggage you intend to check-in and have the docket ready for inspection once you have moved through the screening point. Alternatively you can present the items at the screening point to undergo security screening. If the security process clears the items, you will be able to take them on your flight. If the screening process does not clear the items, you will be asked to surrender them. Certain exemptions apply for medicines, medical products, medical devices, and baby products that you may need during the flight. Details of these exemptions are covered in the exemptions part of this site. Passengers travelling on international flights from Australia need to be aware of the quantity limits for liquids, aerosols and gels that can be taken through a security screening point at the airport. Liquid, aerosol or gel products must be in containers of 100 millilitres/grams or less. The containers must be carried in one transparent, resealable plastic bag, like the one in the image below. The plastic bag must be the type that can be sealed and resealed with a sealing mechanism, like a sandwich bag or freezer bag. Only one bag is allowed for each passenger, with exceptions for carers who may carry the bag/s of the people in their care, including children. All containers must fit comfortably into the plastic bag and the bag must be sealed. For more information visit the Smart Traveller website. Every piece of information that is received from members of the public today could be invaluable in keeping Australia safe from terrorism tomorrow. It is often the smallest details that make the biggest difference. Australian Government security requirements dictate that vehicles dropping off passengers at the front of the terminal must be attended at all times. The driver of the vehicle must remain with their vehicle and may only remain in the drop-off area for a maximum of two minutes. Patrons and visitors to Darwin International Airport are encouraged to use the car parking options available to them at the airport if they wish to enter the terminals to greet or farewell passengers. The car park has a 15 minute free period if you wish to take advantage of this option. Bladed implements such as knives and tools are prohibited in hand luggage. These items should instead be packed in your checked luggage for air travel. For an up to date list of prohibited items please visit the TravelSECURE website. If these items are not surrendered at the screening points, the passenger is in breach of Australian Government regulations and the airline will not allow the passenger to travel. Please ensure no items are in your hand luggage before reaching the screening point otherwise detection of these items at screening points will require you to surrender these. Passengers and airport visitors are warned that all threats and comments made about the carrying of weapons or explosives - whether intended as a joke or not - will be taken seriously and may result in refusal of carriage onto the flight and prosecution by the Australian Federal Police. Visit the Australian Government's travel advisory (including travel warnings and travel tips) and consular assistance service. The Australian Government has developed a new traveller-friendly website, TravelSECURE, to help you to navigate the security checks at the airport quickly and easily, and to ensure you are adequately prepared for your trip. TravelSECURE is an easy-to-use resource that consolidates traveller and transport security information, videos and fact sheets in one easy-to-find place. The site includes information about prohibited items, passenger and baggage screening, and liquids, aerosols and gels (LAGs) restrictions. Travellers will also find recommendations about travelling with children, laptops, medicines and sports equipment. Baggage must never be left unattended in public areas. All such baggage will be treated as suspicious. All belongings should be clearly tagged with your contact details and your destination displayed on the outside. Airlines supply luggage tags for this purpose and are available at the check-in counters. Ensure that you pack your own bags and never take items on board an aircraft for other people. Passengers and guests at Darwin Airport are welcome to enjoy high speed internet at no cost, throughout most areas within the Airport. Look for our free wi-fi hotspot called DarwinAirport on your device when you enter the terminal. Remember, it's fast and it's free!